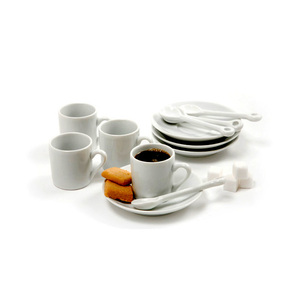 Elegant demitasse set in white porcelain. White high-fired porcelain tableware. 12 piece / 4 person setting set. Includes 4 - 2oz/60ml cups, 4 saucers, and 4 - 1/2tsp./2.5ml stirring spoons. Hand washing recommended.